/ Modified jun 3, 2014 9:32 a.m.
Expanse of parched earth seeing early revival following Morelos Dam floodgates reopening; environmentalists ecstatic. 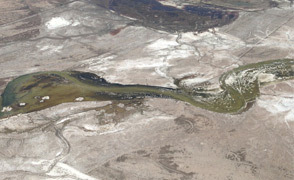 The Colorado River delta was once a fertile wetland of green lagoons and winding river channels. The fresh waters of the Colorado mingled there, at the southern end of the delta in Mexico’s Baja California state, with the salty waters of the Sea of Cortez. Today, 90 percent of those waters are diverted along the river’s path through the Southwest to provide drinking water to 35 million people and irrigate crops in Arizona and the six other states along the basin. The Colorado River dies at the Morelos Dam, which straddles the U.S.-Mexico border outside of Yuma. From there, what’s left of the river is steered away from its natural path to irrigation pipelines in the Mexicali valley and into homes in Tijuana. The Colorado River delta has been a vast expanse of parched, cracked earth. That is until the floodgates of the Morelos Dam were thrust open on March 23. "Water was being released into the river...and all of this area got inundated," said Francisco Zamora, who is the Colorado River Delta program director of the Sonoran Institute. He witnessed the event. "It was really exciting to see that happening." The opening of the Morelos Dam was made possible by a landmark agreement between the U.S. and Mexico called Minute 319. This is the first time water from the Colorado has ever been allocated for purely environmental purposes. The flooding, called a pulse flow, is an eight-week long pilot project. Zamora, who’s been involved in the project since its inception, said the idea came about when heavy rains in the 1980s and 90s raised the river above the floodgates, flowing back into the delta for the first time since the 60s. The opening of the Morelos Dam was made possible by a landmark agreement between the U.S. and Mexico called Minute 319. "At that point we realized that if you bring water back into the delta it was feasible to restore some of these wetlands," he said. Jennifer Pitt of the Environmental Defense Fund said academics and environmental groups banded together to persuade the U.S. and Mexico to work on managing the water of the Colorado. "About seven years ago, we began talking seriously about the prospect of U.S. and Mexico working on the delta on a collaborative, cooperative manner," she said. That conversation began when the bilateral relations over the Colorado were at a low point. The U.S. planned to line the All American Canal in Southern California, which was a project that Mexico said would significantly reduce groundwater levels across the border. "We were able to persuade decision-makers in both countries that it was really time to turn the corner in the relationship and really try something different," Pitt said. "That instead of unilateral actions on either side of the border with no particular concern for impacts on the other side of the border it would be better to have a collaborative approach." In 2012, the Mexican and American governments signed Minute 319, and the pulse flow was one of the provisions it contained. Zamora said the flow is intended to replicate what the river would do under natural conditions, which is what it did for thousands of years. "During the months of late March and April, with the snow melt in the upper basin, a lot of water will come in a short period of time," he said. "So the pulse flow is mimicking that on a smaller scale." 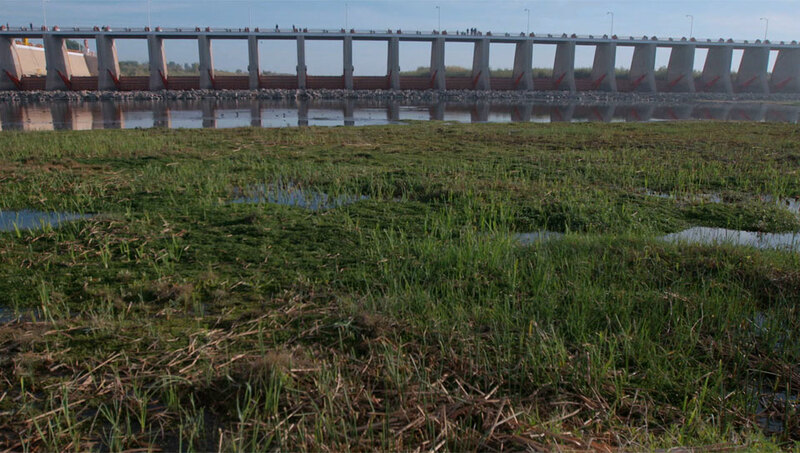 During the eight-week project, which ended on Sunday, just less than 1 percent of the river’s annual average flow was released into the delta. Teams of scientists from environmental groups and universities have been closely monitoring the impact that the restored flow has had on this desiccated region. Edward Glenn, professor emeritus in the University of Arizona's Department of Soil, Water and Environmental Science,was one of the scientists who discovered the revitalizing impact that floods had on the region 30 years ago. "We have a team down there right now that (is) looking to see how many cottonwood and willow trees germinated in response to this pulse flow," he said. "That’s really the pay off for the ecosystem, because those trees are needed for the birds. There’s 10 times more birds in the delta than on the U.S.…side of the river." Seen from above, several days before the end of the pulse flow, the serpentine flow of water weaved its way past the towns of Northern Mexico, through farmland and restoration sites, stretching towards the Sea of Cortez. Cottonwoods on its banks glowed green and flocks of birds soared from the blue water high into the horizon. Although the tap of the pulse flow has now been shut off, a much smaller base flow will continue to deliver water to restoration sites in the delta over the next four years. What lies ahead for the Colorado River delta, and in fact for the river as a whole, is far from clear. Fourteen years of drought coupled with rapidly growing demand have severely diminished reservoir levels on the river. And experts say the western U.S. should brace for even drier conditions, which will result in permanent and substantially lower flow on the Colorado. Minute 319 expires in 2017, and although many onlookers say they expect Mexico and the U.S. to continue to cooperate, that’s far from a certainty. But Zamora said he is hopeful thanks in a large part to the pulse flow. "I do believe that it has demonstrated that with a small amount of water we can restore new habitat, new wetlands," he said. "And it has also allowed the governments of the U.S. and Mexico to see that working together, we can make a difference." 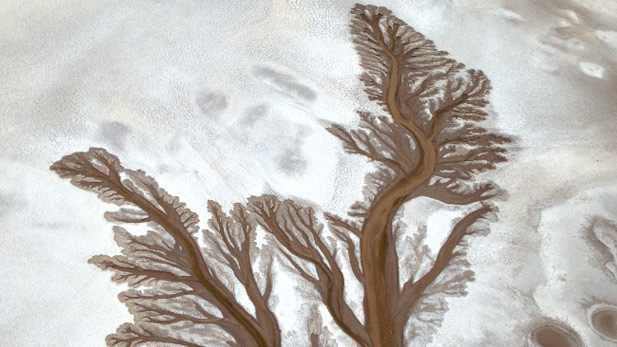 Aerial view of water making its way into the parched Colorado River delta.